Paris attacks suspect Salah Abdeslam's lawyer says he plans to take legal action against a French prosecutor for breach of confidentiality. The Paris prosecutor told reporters that Abdeslam had admitted he wanted to blow himself up during the attacks on 13 November but then changed his mind. The bombings and shootings, claimed by the so-called Islamic State (IS), left 130 people dead and dozens injured. Abdeslam was arrested in Belgium last week after four months on the run. The Belgian authorities have charged him with terrorism offences. He has decided to fight extradition to France, which could take up to three months. Abdeslam's Belgian lawyer, Sven Mary, says his client is co-operating with the authorities. At a news conference in the French capital on Saturday, Paris prosecutor Francois Molins, referring to Abdeslam's statement to Belgian police, said: "He wanted to blow himself up at the Stade de France and, I quote, backed out." He added that people should treat with caution initial statements by the 26-year-old French national. Mr Mary said he would take legal action against Mr Molins for breaching the confidentiality of the investigation. He told Belgian public broadcaster RTBF that Mr Molins' comments at a news conference were "a violation... I cannot let it go unchallenged". Meanwhile, France is sending more troops to its borders after the arrest of Abdeslam. Interior Minister Bernard Cazeneuve said they would join more than 5,000 police mobilised since the attacks. Interpol has urged increased border security saying suspects may seek to flee after the arrest on Friday. Abdeslam is believed to have fled shortly after the November attacks, returning to the Molenbeek district of Brussels. He is being held at a high-security jail in Belgium. Is Molenbeek a haven for Belgian jihadis? Investigators hope Abdeslam, who was shot in the leg during his arrest, will reveal more information about the IS network behind the Paris attacks, its financing and plans. 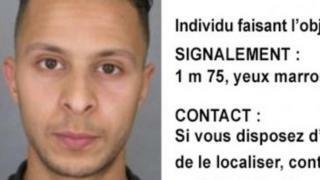 They believe he helped with logistics, including renting rooms and driving suicide bombers to the Stade de France. The subject of a massive manhunt, Salah Abdeslam was arrested about 500m (1,600ft) from his home in Molenbeek. His brother, Brahim, was one of the Paris attackers who blew himself up. Another man arrested at the same time as Salah Abdeslam on Friday, Monir Ahmed Alaaj, has also been charged with participation in terrorist murder and the activities of a terrorist group, the Belgian prosecutors say. Friday's raid also saw three members of a family detained. They include Abid Aberkan, described as a friend of Abdeslam, who has been charged with participation in the activities of a terrorist organisation and harbouring criminals. Another family member, identified as Djemila M, has been charged with harbouring criminals, but is not in custody, the prosecutor's office says. The raid came after Abdeslam's fingerprints were found in a flat in another Brussels district, Forest, raided on Tuesday. Footage showed Abdeslam being bundled into a police car on Friday after a volley of gunfire. Alaaj was also injured during the arrests. Prosecutors said Alaaj had travelled with Abdeslam to Germany last October, where his fingerprints were taken during an identity check. A false Syrian passport in Alaaj's name and Belgian identity papers under an alias were found in a flat in Forest raided on Tuesday. Along with the Stade de France, the Paris bombings and shootings targeted the Bataclan concert hall and bars and restaurants. Officials have identified most of the people they believe to have carried out the assaults. French President Francois Hollande says more arrests may follow. Most of the suspects either died during the attacks or were killed in subsequent police raids. What happened during the Paris attacks? Who were the Paris attackers?